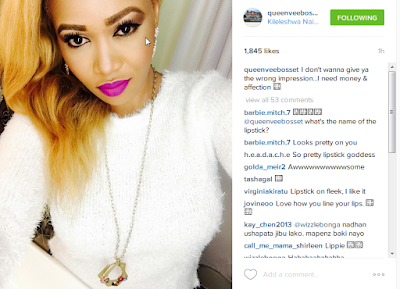 Socialite Vera Sidika is one of the well endowed Socialites in the country. The bootylicious socialite is currently nursing some minor injuries after she engaged in a fight with socialite Pendo in a club. The two have officially registered a 2016 beef as Vera vowed to take legal action against Pendo. Well away from that, Sassy socialite Vera Sidika took to social media to reveal that she only needs money and affection. Judging by her instagram post bootylicious Vera does not have time for mediocrity and broke people.